Gift Worth $400 Million To Art Institute Of Chicago Includes Works By Warhol : The Two-Way The donation was confirmed after the museum agreed to display the 42 paintings, silk-screens and sculptures for the next 50 years. 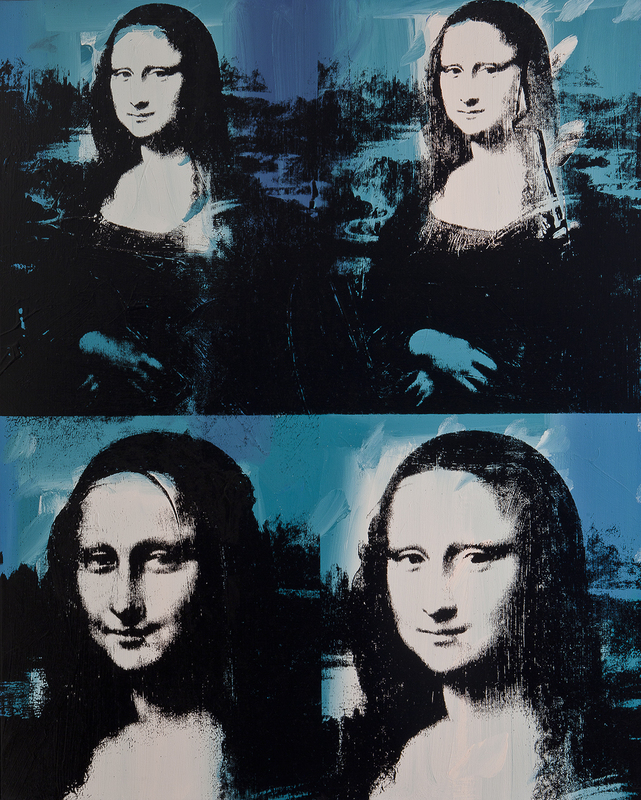 Andy Warhol's Mona Lisa Four Times, 1978. Chicago art collectors Stefan Edlis and Gael Neeson have given a "landmark gift" of pop art to the Art Institute of Chicago, handing over 42 works that were created by Andy Warhol, Jasper Johns and others. After the donation was officially accepted Tuesday night, the museum's president and director, Douglas Druick, told The Chicago Tribune, "This is one of the landmark gifts in our 136-year history." The collection, which has an estimated value of $400 million, also includes works by Roy Lichtenstein and photographs by Cindy Sherman and Richard Prince. The donation was confirmed after the museum agreed to display the 42 paintings, silk-screens and sculptures for the next 50 years. Edlis, 89, is a former plastics executive; he and his wife, Neeson, have given their support to several large U.S. museums, including the Whitney Museum of American Art. Edlis tells the Tribune that the agreement avoids one of his peeves about donated art. "They always end up being shown for a short period of time, and then they end up in storage," he says. "Art historians say the collection is among the world's greatest groups of postwar Pop art ever assembled, collectively chronicling art's 20th century shift from the swirly abstracts of the 1940s and 1950s toward the colorful, wry images of everyday objects that define Pop art in the U.S. during the 1960s. The group from Mr. Edlis and Ms. Neeson fill a major gap in the Art Institute's Pop collection, which was widely considered weak."